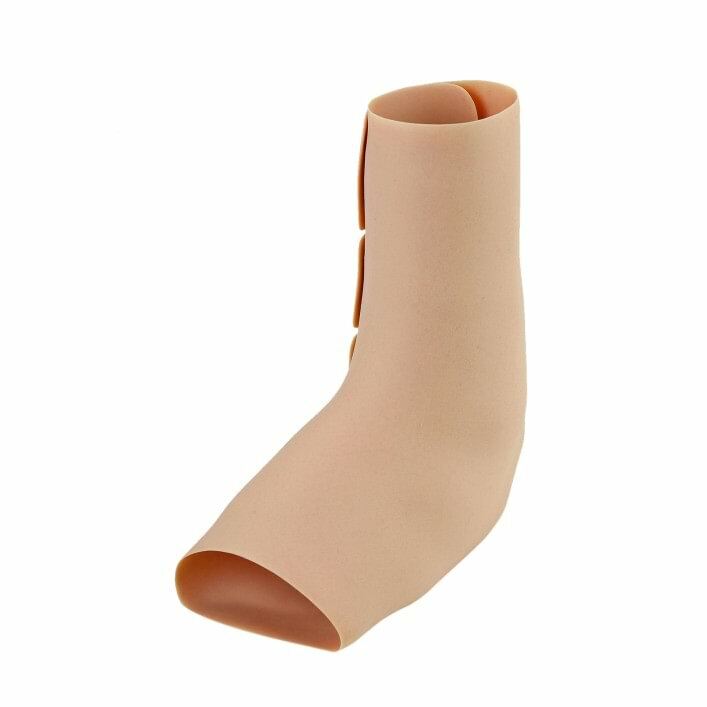 Fabricated from silicone, the silicone ankle foot orthosis (SAFO) is an alternative to conventional orthoses for dorsiflexor weakness. In contrast to conventional ankle foot orthoses, the SAFO supports your foot not from below but across the arch of the foot from above in order to prevent the foot from dropping. The great advantage of this principle is that thanks to the thin, flexible sole, you can feel the ground conditions directly and detect uneven surfaces such as stones and doorsteps. The result: enhanced safety and self-confidence when walking. Since the SAFO is worn directly on the foot, it can be worn without firm shoes. You can even go barefoot. This lets you wear the orthosis throughout the day even when you’re swimming, bathing, or showering – out and about, at the pool or at home. Thanks to the thin, flexible sole and the open heel, the SAFO lets you feel the ground conditions directly. This results in a heel strike that is noticeably safer. As a result, you can easily cross uneven surfaces such as doorsteps or stairs as well. The SAFO is custom fabricated according to your dimensions, guaranteeing the best possible fit on the foot and joint. Thanks to its precise fit, the SAFO lets you walk comfortably and safely, and offers a high level of comfort and freedom of movement – whether barefoot or wearing a shoe – without leaving pressure points. Thanks to optimum fit of the SAFO on the foot and joint, the orthosis offers you inconspicuous, elegant support in everyday life without being bulky. This makes it comfortable to wear the orthosis when you’re out and about, but especially at home as well. Using soft yet sturdy silicone guarantees that the orthosis remains comfortable to wear over longer periods as well. Due to its material properties, you can also apply for the SAFO as a waterproof walking aid in addition to your conventional orthosis. Ask your O&P professional for further information. Whether you’re at the beach while swimming or in the city, you can always rely on the SAFO. The water resistance and breathability of the material means the orthosis can be worn during a range of sports and everyday activities, whether you’re barefoot or wearing firm shoes. With daily care on the inside and outside, you can wear your orthosis every day from morning to evening. All you need to clean it is water and pH-neutral soap. The SAFO is easy to close with a hook-and-loop closure. Two versions are available: The SAFO ONE is discreetly fastened at the foot with an integrated hook-and-loop closure. The SAFO Walk is even easier to fasten using a hook-and-loop closure on the outside – but is also a bit more noticeable in comparison to the SAFO ONE. The SAFO versions are available for children as well. Your child’s willingness to wear the orthosis is significantly influenced by the option of custom-shaping it as well as its high level of comfort. 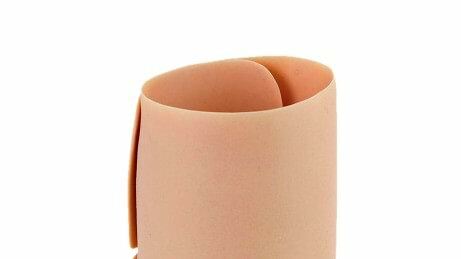 The chosen silicone material is hypoallergenic and breathable. This is important as the SAFO is worn directly on your skin. The risk of skin irritations and abrasions is very low thanks to the custom fit. Depending on your needs, the SAFO can be fabricated in your own preferred design or be made as inconspicuous as possible using one of the seven available skin tones. The chosen high-grade silicone materials cover all important characteristics for an optimum fitting: functionality, aesthetics and comfort. Temperature and UV-resistance are just two of the advantages of silicone materials. 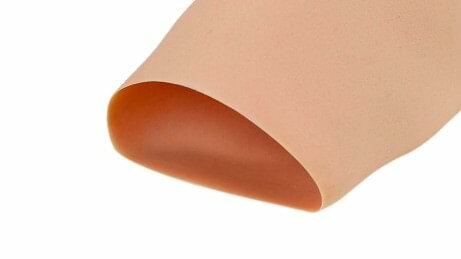 Orthoses made from silicone are also easy to care for and very straightforward to clean. After use, they should be cleaned daily with water and pH-neutral soap on the inside and outside. Permanent stains do not stand a chance if the care instructions are followed.